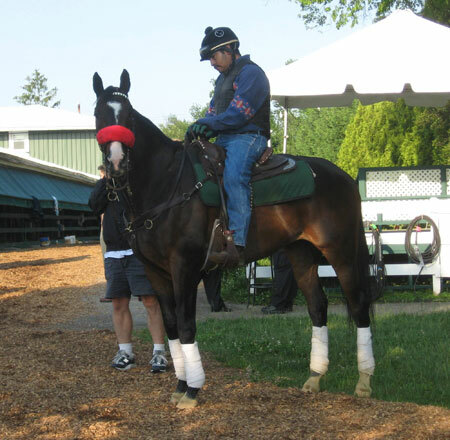 With his induction into the Hall of Fame today here is a reprint of Lava Man's story from May 23, 2012. 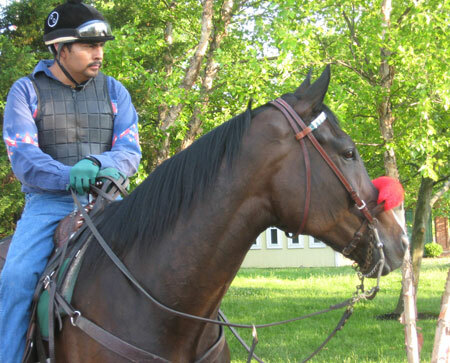 In Sept. 2008, it was announced that Lava Man was going to be retired to Old Friends. It never happened. He had been turned out briefly on a small farm and all those around him stated emphatically that he hated it. The sedentary life wasn’t for him. He wanted and needed the action and excitement of the racetrack. 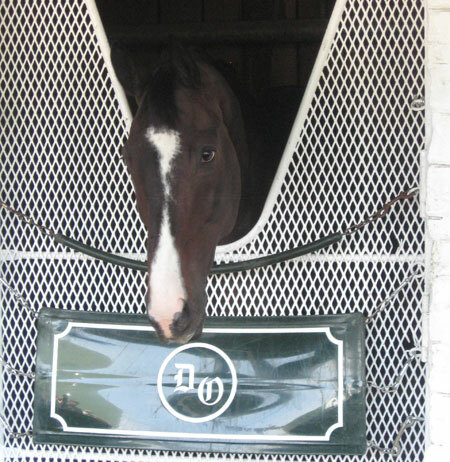 He was returned to trainer Doug O’Neill’s barn, where he became a lead pony. After nearly four years working at his new job in relative quiet and tranquility, Lava Man, now finds himself caught up in the whirlwind of the Triple Crown. The cheers that accompany his star pupil, I’ll Have Another, are always within ear shot, and Lava Man has no reason to believe they are not meant for him. 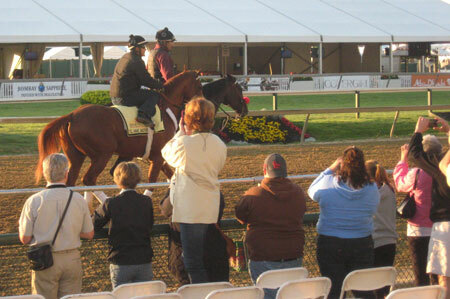 In fact, many of the cheers now are meant for him, as evidenced by the ovation he received after the Preakness Stakes prior to I’ll Have Another’s return. He has had photos and stories plastered across the pages of publications all over the country, something he never even achieved during his magnificent career in California. He currently is a star on Youtube, where a laugh out loud video shows him walking the shedrow at Hollywood Park unattended and casually going over to a feed bin, opening it himself, and partaking in dinner. Watch the video here. 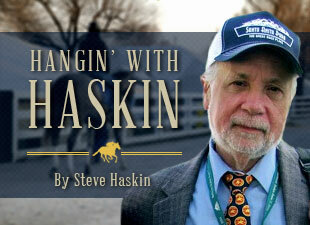 With Lava Man all the rage again, we thought this would be a good time to reprint a column we wrote back on Sept. 6, 2008, telling the story of one of the greatest claims in racing history, if not THE greatest. 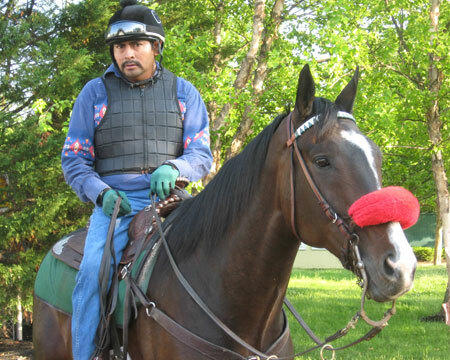 Here then is the story of Lava Man. June 19, 2003 was a warm, humid day in Stockton, California, with a brisk 20 mile-an-hour-wind. Those that attended the races at the San Joaquin Fair were there just for fun and certainly were not looking for any future superstars. The fourth race on the card, a $12,500 maiden claiming race for 2-year-olds, had no particular meaning, and you can bet no one paid any attention whatsoever to the fourth-place finisher – a 35-1 shot named Lava Man, who was racing for his owner, breeder, and trainer Lonnie Arterburn, along with several partners. Following three more defeats, at Santa Rosa Fair and Bay Meadows, Lava Man finally broke his maiden by four lengths on the turf at Golden Gate under jockey Francisco Duran. Even then, the son of Slew City Slew had character and charisma, and made people notice him. Lava Man followed up his maiden win with a starter allowance victory, but lost his next four starts before winning an allowance race on the grass at Bay Meadows by a nose. Arterburn had removed his blinkers for the race, and Lava Man showed tremendous courage to win after a stretch-long duel. It was that same tenacity and courage under fire that would enable to him to win back-to-back gut-wrenchers in the Hollywood Gold Cup (gr. I). On July 28, 2004, Lava Man was entered in a $62,500 claiming race on the grass at Del Mar. One person who had his eye on the horse was Steve Kenly, who wanted to claim him, but was talked out of it by his trainer Doug O’Neill. “On the form and on the Sheets, I just felt $62,500 was too much money,” O’Neill said. Kenly, who had been looking specifically for 3-year-old Cal-breds, because of the state’s lucrative program, had his eye on several horses and Lava Man was one of them. Lava Man finished sixth in the race, but had a ton of trouble, getting squeezed and trapped between horses. Kenly remembered that and stored it in the back of his head in case the horse showed up again for a price. Meanwhile, Arterburn hadn’t realized what kind of a bullet he had dodged. Would he tempt fate again? The answer, sadly for him, was yes. On August 13, Lava Man was back at Del Mar, this time for a $50,000 tag. Arterburn’s friend, veterinarian Kim Kuhlmann, who was co-owner and is co-breeder of Lava Man, was friends with trainer Mike Puype, so instead of shipping Lava Man back to Northern California, they decided to leave him with Puype at Hollywood Park and let him train down there for a couple of weeks. When a $50,000 claiming race showed up in the book, Puype told Arterburn about it. Arterburn had Puype enter the horse and saddle him in his absence. It was a decision he has regretted every day since. He was right about the trainers, but didn’t count on an owner. Kenly, meanwhile, had been on the lookout for Lava Man, and was delighted to see him show up for $50,000. This time, there was no stopping him. When he saw him entered, he called O’Neill and told him, “Well, you just saved us $12,500.” As it turned out, Kenly’s was the only claim. It was decided to point him for the Pomona Derby at Fairplex, and Lava Man won the Derby Trial by 6 1/4 lengths in his first start for his new connections. He then finished a well-beaten third in the Pomona Derby and proceeded to lose his next six races. But he did finish second in the California Cup Classic and On Trust Handicap for Cal-breds before finishing a game second to Rock Hard Ten in the grade I Malibu Stakes. Just when it looked as if his career was about take off, he lost his form that winter, turning in three poor performances in state-bred stakes, including the aforementioned Sunshine Millions at Gulfstream. Then it was O’Neill’s and Kenly's turn to flirt with destiny. Arterburn, still upset over losing the horse, waited patiently, hoping to see Lava Man back in for a price. He was determined to get the horse back. It took a year, but there he was, on May 14, 2005, entered for a $100,000 claiming price. Unfortunately for Arterburn, he was in the process of moving to Florida in an attempt to upgrade his stock and was unable to come up with the money. It was that move that precipitated his putting Lava Man in for $50,000. And now it was that same move that prevented him from getting him back. “I was in the middle of real estate deals trying to get a farm bought,” Arterburn said. “I couldn’t find any partners who were interested in claiming him for that price, and I couldn’t afford to claim him back myself. It was bad timing for me and good timing for them. It was ironic, in a bad way, that we let him slip through our fingers because at the time we were in the pursuit of getting better horses some day. As Lava Man developed into a grade I winner and then a legend, becoming the first horse to sweep the grade I Santa Anita Handicap, Hollywood Gold Cup, and Pacific Classic in the same year, Arterburn became more distressed over his misfortune. Now he’s had to watch Lava Man make more history by emulating Native Diver’s feat of winning three consecutive runnings of the Hollywood Gold Cup. Kenly had lucked out getting Lava Man, as all the forces seemed to be working in his favor. So, why in the world did he and O’Neill decide to tempt fate and put a grade I-placed horse in a claiming race, albeit for $100,000? So, that pretty much is the story of Lava Man and the contrasting fortunes of two men. Kenly, as well as his father, Wood, and O’Neill, gives thanks every day for the fortunes that smiled down on him. But, he still never takes anything for granted. Lava Man never showed his greatness outside of California. For one reason or another he ran poorly in all his forays outside the Golden State. But he still was the king of California. He still was a racing treasure. He still was a legend. In short, he still was Lava Man. And that’s enough in anyone’s lifetime.